One uncommonly gorgeous sunflower! Standout variety’s flowers, leaves and stems are suffused with dark-red-to-purple hues. 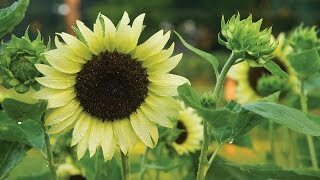 Low-growing, vigorously branching flame-type 20-30” tall sunflower’s merlot-colored ray petals transition to a pretty pink. Full sun. Sunflower, Ms. Mars is rated 3.7 out of 5 by 18. Rated 5 out of 5 by cmnc from Show stopper! I started these inside towards the end of winter (January) and planted them outside by March. They had a 100% germination rate and grew fast! They grew to about 2.5 ft and the flower heads were about 8 inches across. Mine didn't turn a pink but more of a brick red with a little touch of pink. A beautiful flower that I am going to grow every year now! Rated 5 out of 5 by jfour from Beautiful flower, easy grower Sowed from seed direct to soil in early May. Two months later, I finally have beautiful blooming sunflowers! See photo. Easy to grow, no special care or maintenance required. They make a LOT of foliage so plan on trimming often if you have other flowers along the bases. Rated 5 out of 5 by Vinogl from Enjoyed while I could! The brief time I was able to enjoy them they were beautiful ! But upon waking one morning they were gone.......After investigating the footprints I learned that the deer love them too.....all flower tops eaten and only the stalks left !! Rated 2 out of 5 by Mrs Jenkins from Intense color but small heads The color of Mrs. Mars is quite unique and intense. However the time it took to grow and produce a head the size of a golf ball with petals was not worth the wait. I was very dissatisfied with the long time it took and the small flowers it produced. Rated 5 out of 5 by Lizabeth from Great Flower to Cut In my garden this flower did not seem to stand out, but when I cut these flowers and put them in a vase I had many compliments. Rated 5 out of 5 by Genie from Squirrels and Rabbits Love Them I planted over 50 seeds ~ they grew very well. Then when they were two feet tall the squirrels and rabbits ate them. Only one made it.